Your permanent lifetime key will be available immediately after a one-time purchase. There are no monthly or annual fees. The 2-file limitation will be removed and any number of files can be merged. Free customer support after your purchase. 30-Day, 100% Money Back Guarantee. 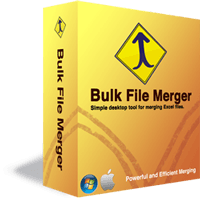 All purchases of Bulk File Merger come with a 30-day money back guarantee. Our online store offers a wide range of secure payment methods such as credit card, PayPal, wire transfer, purchase order, or check. The Bulk File Merger Online Store runs on secure Fastspring technologies and highly secured servers with SSL certification.